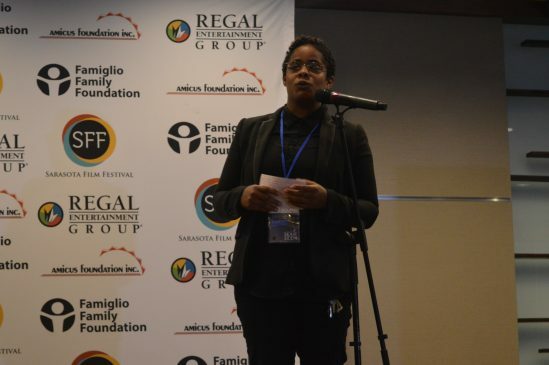 Shakira Refos, director of outreach for SFF, gave a speech describing the over 300 volunteers and the dedicated Direc- torial Board behind SFF’s production. 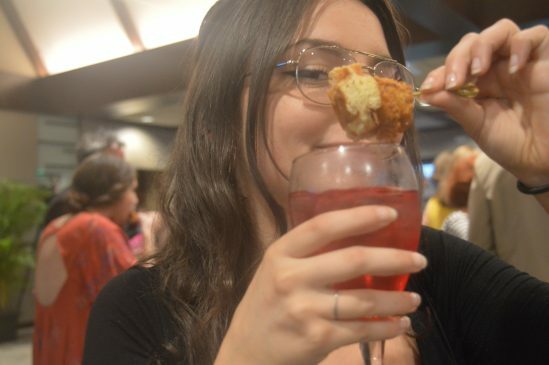 Young reporters from Girls Inc.
Catalyst online editor and third-year, Magdalene Taylor, shows off one of the chicken and waffle hors d’oeuvres passed around to attendants at the press event. The crowd at the event was filled with both people from the press and sponsors of the festival. Pint-sized reporters, chicken and waffles and anticipation filled the air at the 2017 Sarasota Film Festival press event. The Sarasota Film Festival (SFF) hosted a press event on March 13 to celebrate the release of the final film program for this year’s events. 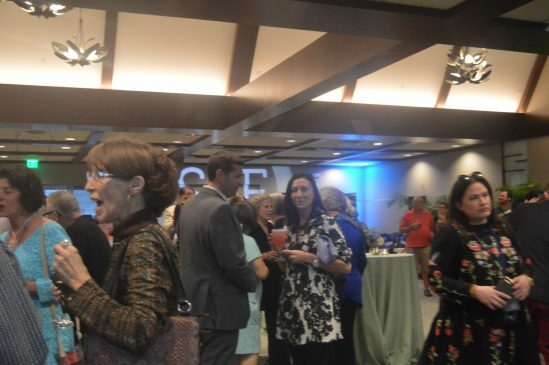 The event took place from 6 p.m. to 9 p.m. at Selby Gardens where attendants huddled inside from the rain and mingled while enjoying hors d’oeuvres, such as tuna sliders and chicken and waffles, and an open bar. Some of the publications in attendance including Sarasota Magazine, Sarasota Herald-Tribune, Beadle Media and the Catalyst. 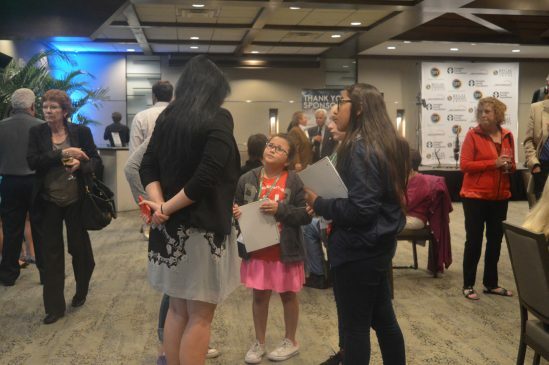 The crowd favorite was a group of child reporters, known as Girl Inc., who eagerly talked to producers and the Directorial Board of SFF for the scoop on this year’s programming. 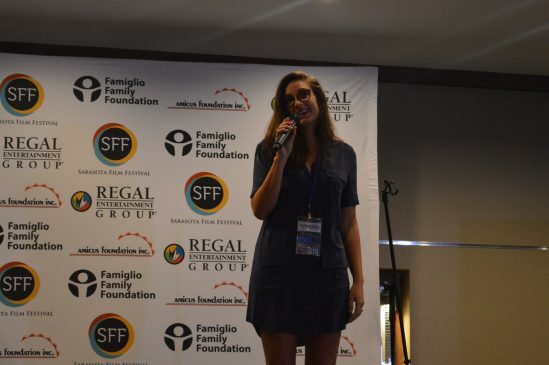 The event featured five-minutes speeches from several integral members of the SFF Directorial team: including Marketing Director Ali Vallarta, Director of Outreach, Shakira Refos, and Chairman and President, and New College alum (‘75), Mark P. Famiglio, before the 2017 SFF Film Guide was given to attendants as they left the event. Famiglio discussed this year’s programming, which featured a record amount of women-identified filmmakers. “Everytime I go to work, I am surrounded by people who are in love with the arts,” Refos said during her speech. Refos began to describe the demographic of the SFF team, including a largely women-identified group of first-generation immigrants and over 300 volunteers. Refos described her own experiences, moving to Sarasota and learning English from reading books and publications such as Highlights, which is the focus of its own IndieVision documentary this year. Additionally, 2,000 students from the Sarasota-Manatee area would be in attendance at the festival due to help from the organization, Embracing Our Differences. “I’m here to say thank you,” Vallarta said when she received the mic, before thanking SFF sponsors as well as the Board of Directors. Vallarta shared that she had been involved with SFF since volunteering while in eighth at Booker Middle School. Vallarta closed her speech by saying thank you in the seven languages that all of the directors were able to speak including: Spanish, Italian, Japanese and Dutch. More information on the Sarasota Film Festival can be found on sarasotafilmfestival.com.